The 180 readings in this beautiful women's devotional are expressed in such a way that they come right from the heart of God himself through his Word. Each reading is accompanied by a related Scripture selection that will encourage women of all ages in their faith walk. 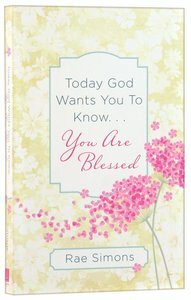 About "Today God Wants You to Know. . .You Are Blessed"
This beautiful women's devotional will delight and encourage readers of all ages in their daily faith walk, as though they are hearing messages straight from God Himself through His Word. With more than 180 just-right-sized readings, each encouraging devotional is accompanied by a related scripture selection that will leave women feeling perfectly blessed. Ellyn Sanna is the author of more than thirty books. She is also the executive editor at Harding House Publishing Service, where she has helped to create hundreds of educational books for young adults. She and her family (along with assorted animals) make their home in upstate New York. Ellyn Sanna is a full-time editor and freelance writer who lives in south central New York state. Her "Juggling Our Lives" series is designed to help busy mothers use their time effectively. Married and the mother of three children, Ellyn also speaks to women's retreats and mothers' groups.